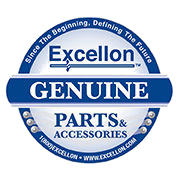 Be assured you are getting the best quality at the best price—buy only genuine Excellon parts and accessories. Placing an order for replacement parts with Excellon is easy. We have three different ways you can use to reach our parts department to place an order. First you can call 1-800-Excellon (392-3556) ext 1 to reach a parts representative. This number is routed to all three parts specialists two of which are in our factory in California and one of which is in our Office in Toronto Canada. Secondly you can email the parts department at parts@excellon.com again this email is accessed by all three of our representatives who can process your order upon receipt. Many of our service personnel also have spare parts on hand. We have spare parts storage locations with over $100,000 of inventory in both our San Jose California and Toronto Canada offices with parts that are available for same day delivery if needed. All other new or reconditioned parts: are covered for 90 days from the shipment date from the factory. Parts replaced under warranty are warranted for the remainder of the original warranty or 30 days whichever is greater. Excellon warrants our parts to be free of defects in material and workmanship for the period as set forth above. The sole responsibility of Excellon under the foregoing warranties shall be, at its option, to repair or replace any defective part or component which fails during the warranty period. Factory replacement parts will be furnished on an exchange basis, and will be either new or certified replacement parts. The forgoing warranties do not extend to disposable parts and components supplied for use, such as collets pressure foot inserts, cassettes and other consumable items. Any product modification, service or repair made by or on behalf of the Purchaser, other than Excellon, without the written approval of Excellon. Parts damage caused by accident, neglect, misuse, environmental conditions, power failure or failure to comply with operating instructions. Damage due to the use of other system components or parts (such as spindle collets), that were not provided by or authorized by Excellon. Any equipment or part that has been disassembled. Any equipment not installed in compliance with Excellon’s installation specifications. Any other cause other than ordinary use. The forgoing warranty is exclusive and in lieu of all other warranties or conditions, expressed or implied (including any implied warranty of merchantability or fitness for particular purpose). Repair or replacement in the manner provided above shall be the sole and exclusive remedy of the Purchaser for breach of warranty and shall constitute fulfillment of all liabilities of Excellon with respect to the quality and performance of the parts. Excellon shall not be liable to Purchaser, whether in contract on in tort (including negligence and strict liability), for loss or damage to property of Purchaser or others, loss of use, loss of revenues or profits. Parts Claimed under either a machine or parts warranty. Parts being returned for a core credit. Parts eligible for core credit are identified by a “+” at the end of the part description as shown in Excellon PARTSLINK. Parts being returned for repair or evaluation. Software that needs to be modified to generate keyless software as needed. Please Note: All parts received without an RMA number will be returned to the customer at their own expense. If you have a part you purchased from an Excellon Authorized dealer this is under warranty, please contact them directly for warranty resolution. In order to expedite your order for a warranty replacement part we will ship the item to be replaced immediately without waiting until we receive your returned part. To facilitate the advanced shipment, you will be charged for the replacement parts temporarily and a full credit will be applied when we receive your returned part and it has been accepted based on our failure analysis review. Invoice number which applies to the part ordered and part serial number if applicable. Please assure that you clearly mark the outside of the package for the returned parts with the Returned authorization Number. This is required to assure that you receive the credit for your warranty item. For returns of other non-warranty items for core credit, evaluation, repair or return to stock, simply call Excellon’s Parts Department at 1-800-EXCELLON (392-3556) ext 1 to get a Return Authorization Number. If you are sending a part back for repair a PO number will be required when you make this call. If you are sending a part back for core credit or as an unused return we will need to know what the original order number that was issued when you ordered the part and the part number. Please remember than in all cases when shipping a part back to Excellon for any reason that the outside of the package must be marked with a return authorization number. If we don’t see this number we will not know what to do with your parts and there is a good chance your parts could be returned at your cost without any action being taken or credit being applied. All RMA numbers are only usable for 30 days. If a package is received after that time frame the offer for repair or credit could be considered void. If you have a spindle to be repaired under warranty, please follow the warranty return procedure outlined above. For your convenience, Excellon offers both a spindle repair and spindle exchange service. Click here to learn more about Excellon’s spindle repair and exchange service. To receive an RMA number for a spindle you want repaired, call Excellon’s Parts Department at 1-800-EXCELLON (392-2556) ext 1. The Customer Care representative will ask you for a PO number to cover the $100.00 spindle evaluation fee, (this fee is credited against the cost of the spindle repair if you should decide to have the work done). They will also need to know what type of spindle you will be sending in and what the spindle serial number is. Once Excellon receives and evaluates the spindle we will send you a detailed report of our findings and a quote to complete the repairs needed. You must authorize the repair and charges to be billed as shown on the quote before we can proceed with the work. If you need a replacement spindle immediately. you can use Excellon’s Spindle Exchange Service. We’ll immediately ship you a replacement spindle (new or refurbished, you decide) and provide you with an RMA number to return the failed spindle for core credit. Call Excellon’s Parts Department at 1-800-EXCELLON (392-3556) to place your order for the replacement spindle and receive an RMA to return the bad one for your core credit. Once again you will need a PO number for use in placing the order to purchase the replacement spindle as well as the spindle type and serial number for the return. * Please remember, in order to receive your core credit all parts that were issued an RMA number must be returned to Excellon within 30 days from the date the RMA number was issued. Returning your bad parts that can be repaired or refurbished for core credit can reduce the cost of maintaining your Excellon Equipment. What is a core credit? Certain parts that are able to be repaired or refurbished can be returned to Excellon for credit against the purchase of a replacement part. Contact Excellon’s Parts Department at 1-800-EXCELLON (392-3556) ext 1 or use PARTSLINK on Excellon’s website to see if the part you are replacing has any core value. If your part is eligible for a core credit ask the customer service representative for an RMA number when placing your order. This number must be written on the outside of the package when retuning your part. When the part is received and processed at our factory a credit will be applied against your account for the core value after evaluation and acceptance. How can I tell if a part can be returned for a core credit? Click here to jump to Excellon’s PARTSLINK page, complete the fields required with the part number and review the product description when it comes up. If there is a core credit available it will be clearly displayed in the last block of the description on the right hand side.